"All individuals, particularly those who are in charge of sports and recreational activities, should be aware of the hazards, establish and follow appropriate guidelines and ensure that those around them do so," said Katie Walsh, EdD, ATC, East Carolina University, who chaired the position statement writing group. "Proper preparation and notifying participants of lightning danger is critical." During the last decade, lightning has caused an average of 42 fatalities yearly in the U.S. and an estimated 10 times as many injuries. Data from 2005 indicated that approximately 15 percent of lightning casualties occurred during organized sports and an additional 25 to 30 percent resulted from recreational activities, but more recent data from 2010-2011 by the National Weather Service suggests that these percentages are much higher, with 48 percent and 62 percent of lightning fatalities attributed to sport and recreation, respectively. For more lightning statistics and facts, click here. Promoting National Weather Service lightning safety slogans such as "No Place Outside is Safe When Thunderstorms are in the Area" or "Half an Hour Since Thunder Roars, Now it's Safe to Go Outdoors." Establishing a chain of command that identifies a specific person to make decisions to remove individuals from the field. Using a reliable means of monitoring the local weather. Identifying safe locations from lightning hazard in advance of events, such as a building where people live or work or a fully enclosed space (or car). Be aware of unsafe locations such as shelters, picnic tables or bus stops, which are partially open to the elements. Other unsafe venue such as towers or trees can also be targets for lightning. Know how long it will take to get to the safe venues and plan accordingly. Identifying specific criteria for suspending and resuming activity, and allow time for evacuation of the premises. 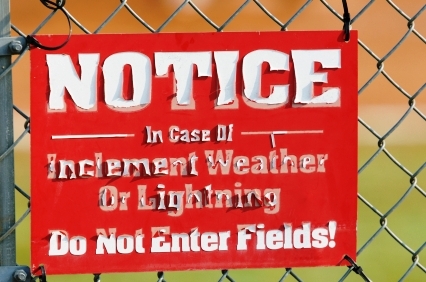 Activities should be suspended until 30 minutes after the last lightning strike or sound of thunder. 2. Ensure lightning and general weather awareness: Recognizing and avoiding the lightning hazard is of utmost importance. Use a designated weather watcher to be actively looking for signs of approaching or developing local thunderstorms, such as high winds, darkening clouds, or lightning and thunder. Use the National Weather Service to monitor local weather before and during outdoor events (note, however, that the NWS does not regularly issue lightning warnings in all locations, nor does it necessarily broadcast information on specific storms). Organizers, particularly of larger events, should watch the skies for approaching or locally developing thunderstorms and obtain continual updates on the local weather from electronic media, including NOAA. Important note: pagers, cell phones, smartphones, or email can transmit notifications, but, while useful, the NATA says they should only supplement the other procedures listed above and, in certain situations, they can actually lull the untrained into a false sense of security. If one does not know how to interpret the data or warnings or is not familiar with the EAP and how to implement it, having a system may be worse than not having a system at all. For each venue, identify substantial, fully-enclosed buildings with wiring and plumbing, such as a school, field house, library, home, or similar habitable building to serve as a safe place from lightning. Note: fully enclosed metal vehicles such as school buses, cars, and vans are also safe locations for evacuations, but convertibles, nonmetal, or open, such as golf carts and most-off-the-road vehicles, provide no lightning protection.